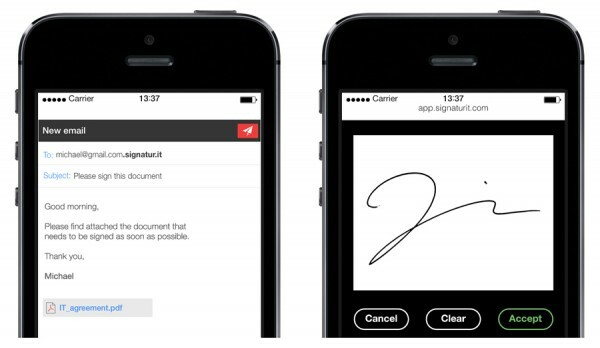 Until now that is, Barcelona-based startup Signaturit has a new solution that enables you to request handwritten signatures through any email client. The technology complies with the EU and US e-signature laws and spares users the need to visit third-party websites or download apps. After signing up all it takes to request a handwritten signature through Signaturit is sending a PDF file using your preferred email client and adding ".signatur.it" to the end of the signatory's address. The platform not only keeps a record of the email address, the name of the file, the location and the exact time it was signed by a Time Stamping Authority (TSA), but also uses a state-of-the-art biometric authentication system and the same encryption standards used by banks and government agencies to ensure the integrity and validity of each signature. Juan Zamora, CEO of Signaturit says, "While e-signature is a tried and true technology, the increasingly demanding regulatory and legal requirements for binding electronic signatures threatens the easy-to-use nature of the solutions available in the market. That is why Signaturit not only provides the simplest solution by allowing users to request signatures through their email client of choice, but does so in compliance with the most demanding data protection requirements". The technology allows deals to be closed faster and saves on traditional document costs by eliminating the need for printing and scanning. It offers real-time reporting along with a dashboard where users can view the status of each transaction. The service is available now and there are pricing models for various sizes of business. You can get more information and try out the service for free on the Signaturit website.